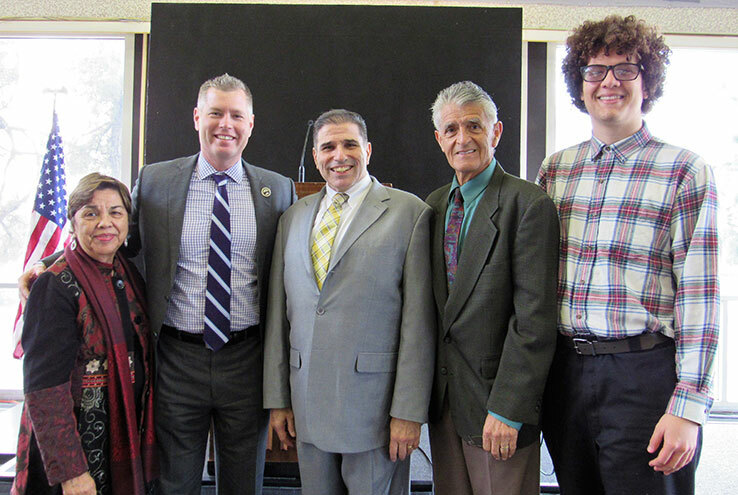 Kevin Horan (second from left), ninth president of Crafton Hills College, is welcomed by SBCCD Trustee Gloria Macias Harrison, Chancellor Brue Baron, SBCCD Trustee Frank Reyes, and CHC Student Trustee Elijah Gerard. Kevin Horan wants to change the way students come through the door at Crafton Hills College. Just days into his tenure as the College’s new president, Horan spoke about his plans for CHC at a staff Spring In-Service Day held Jan. 11. The former vice president of instruction and student services at Los Medanos College spoke frankly about his desire to make sure everyone has a say in the college’s future, particularly when it comes to student success through guided pathways, a new funding formula focused on student achievement and the state going back to its roots when higher education was available to the public at no-cost. Dr. Kevin Horan, ninth president of Crafton Hills College, addresses faculty and staff on Friday, Jan. 12. Prior to his appointment at Crafton, Horan built a name for himself in education through his work in student services with the Contra Costa Community College District, most recently with Los Medanos in Pittsburg, Calif., where he led efforts to increase student success with an emphasis on inclusion and collaboration between faculty and students. He also led the planning and implementation of a more than $125 million-dollar bond to improve on-campus facilities at Los Medanos, including a new kinesiology and athletics center, and a new student union. “So, I feel very prepared for the role as president at Crafton,” he said. Horan believes the key to Crafton’s future success is by collaborating with the public and the site’s sister college, San Bernardino Valley College. He also wants to look at expanding programs – both credit and non-credit - and professional development opportunities on-campus. Jan. 7 marked Horan’s first day on the job after a search committee recommended him for the position from a pool of 50 applicants. The San Bernardino Community College District Board of Trustees approved his appointment during a special public meeting on Nov. 19. CHC’s Spring In-Service Day officially welcomed back faculty and staff from winter break a few days before the Spring semester was set to begin on Jan. 14. In addition to Horan’s introduction, the day included workshops and remarks from Crafton and San Bernardino Community College District leaders. The community is invited to the Investiture Ceremony and Reception for Dr. Horan on Friday, Feb. 1, 3-5 p.m. at the Finkelstein Performing Arts Center on the campus of Crafton Hills College, 11711 Sand Canyon Rd., Yucaipa. More information is posted at www.craftonhills.edu.